Heat oven to 350°F. Line 13x9-inch pan with foil; spray foil with cooking spray. In large bowl, break up cookie dough. Add lemon peel; beat with electric mixer on low speed until peel is well combined. Press dough in bottom of pan. Sprinkle white chips, coconut and macadamia nuts over dough. In small bowl, stir together condensed milk, lemon juice and lemon extract. Pour over top. Bake 28 to 35 minutes or until edges are golden brown and center is slightly glossy. Cool completely, about 45 minutes. Cut into 6 rows by 4 rows. Macadamia nuts are expensive, so they're optional. You can also use pecans or walnuts, or omit the nuts altogether. 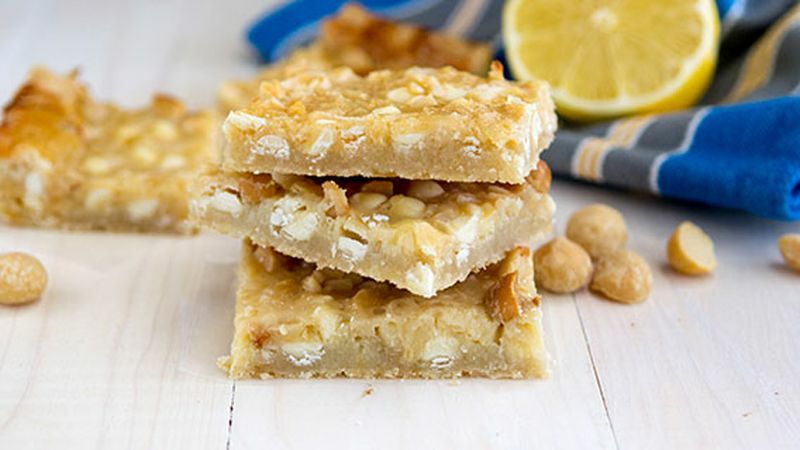 The lemon extract is optional but adds a punch of lemon flavor. For a more decorative bar, melt an additional 1/2 cup white vanilla baking chips and drizzle over the cooled bars.